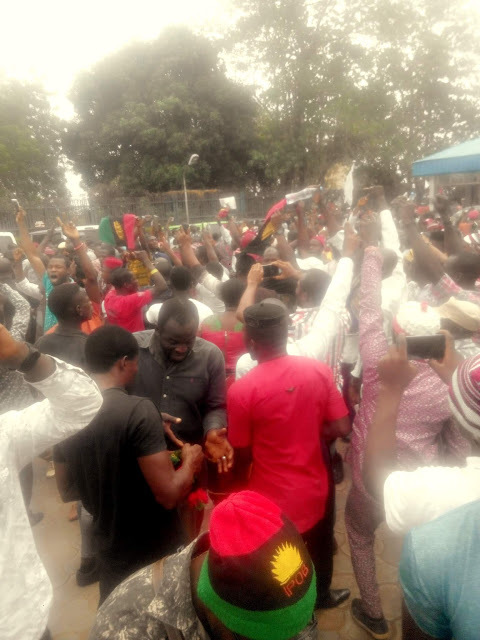 Members of the Indigenous People of Biafra (IPOB), on Tuesday takeover the capital city of Enugu in peaceful protest. IPOB protested against what it described as conspiracy of Igbo politicians with the Federal government against the people of Biafra. The group took their protest to a venue where Eastern Consultative Assembly (ECA), among Igbo politicians were having a meeting in Enugu, in which some of the politicians took to their heels. IPOB also took their protest to the streets in letting the public know their grievances. A member who spoke to Orsu24news on the sideline, said that most of the Igbo politicians conspired with the federal government in bringing Operation Python Dance to the region which led to the disappearance of its Leader, continue imprisonment and killing of its members. He said that IPOB’s decision to restore Biafra was final, saying that the earlier the Nigerian government give referedum to the people will be better.